All too often, individuals die before making a will and estate plan. Even if you don’t have children, a large estate, or a spouse, it is important to have a will that designates what happens to your property after your death. Most people understand that they need a will, but never take the time to create one, leaving the courts to decide who gets what when someone dies. What are the consequences for those individuals? Intestate succession laws affect only assets that would have passed through your will. Usually, that includes assets that you own alone, in your name. Generally, these assets will go to the spouse or children, or if there is neither, a close relative. 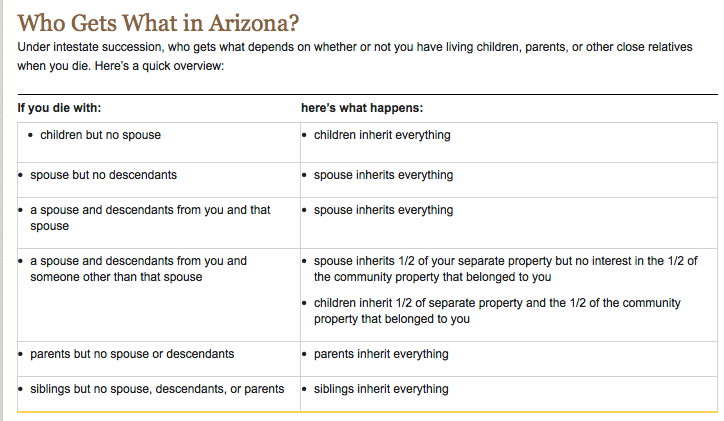 If no relatives can be found to inherit the property, it will go to the state. Also, if no will has been created, a court will decide who will care for young children and their property if the other parent is unavailable or unfit to do so. Typically, property distribution (without a will) depends on whether one is married or single, and whether you or your spouse has any children. If your estate, property or needs aren’t complex, you can create a simple will that can cover the basics of what happens when you die. This is an easier, more affordable solution that allows you to quickly and easily outline your preferences after you pass.